Godwins Tree Surveys provide arboricultural reports for property buyers. Our tree reports are produced by a professional arboriculturists, and we have many years experience of undertaking such tree surveys. We are fully qualified and insured to provide arboricultural reports for insurers and mortgage providers. Our arboricultural reports contain essential information including a detailed assessment of all trees within a property and on neighbouring land. The detailed assessment records species type, proximity to structures and general tree health, making specific recommendations to ensure that trees are managed to prevent future structural damage. Building surveys may recommend that an arboricultural report is undertaken to assess concerns from nearby trees. Tree related clay shrinkage subsidence is one of the main concerns, which occurs as tree roots remove soil moisture. The result is ground movement that can cause building foundations to subside. Our arboricultural reports will evaluate all trees within influencing distance to a subject property, making specific recommendations to prevent future conflicts. 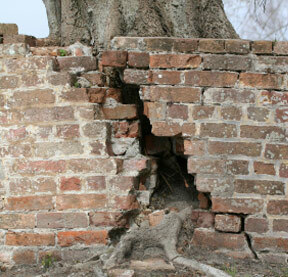 Tree damage to structures and buildings can also occur as a result of the pressures applied by expanding root growth. Generally, this occurs close to the tree as a result of an increase in trunk or roots growth. This type of ‘direct damage’ can occur in any soil type. If you would like to discuss your arboricultural report, you may contact us free on 0800 030 4045 or you can email us via our CONTACT US page and we will promptly deal with your enquiry.